The aboriginal people of Australia have expressed themselves through a form of geometric painting for thousands of years. These paintings tell the stories of dreamtime, myths of spirituality, community and survival. The geometry and symbolism of dreamtime painting create an excellent opportunity for combining art, mathematics, language arts, multiculturalism and social studies in a creative context. The simple geometric symbols found in this art tell stories of hunting, dreaming and community. MicroWorlds software is a terrific canvas for expressing the dreamtime designs of you and your students. Take a look at the following web sites to learn more about aboriginal art. Perhaps you will be inspired to create your own masterpiece! The procedureality of MicroWorlds allows the user to create tools for creating their art. You might think of these procedures as a collection of different paintbrushes. Each procedure creates a different type of geometric figure. The use of numerical variables/inputs allows the user to paint with number. Since the dreamtime designs are composed of dots, we need a basic dot procedure. This one puts the turtle's pen down and then goes fd 0. You may experiment with the size of the dot by either changing the pen size or changing the shape of the turtle and stamping the turtle costume rather than drawing a dot. Experiment with each of the three dot procedures and determine which one you wish to use. Only one procedure should be in the procedure tab of your project. l stands for line and creates a line segment of a distance :length with dots :spacing apart. In other words, a l 50 5 would create a segment 50 units long with turtle steps 5 units apart. Ten dots would compose the line segment. You may use this procedure in superprocedures creating tracks or other geometric shapes. c stands for circle and creates a circle of a radius :radius with dots :spacing apart around the circumference. Can you make a procedure that draws concentric circles? Create the following procedure and try it by typing CIRCLES in the command center. What does it do? 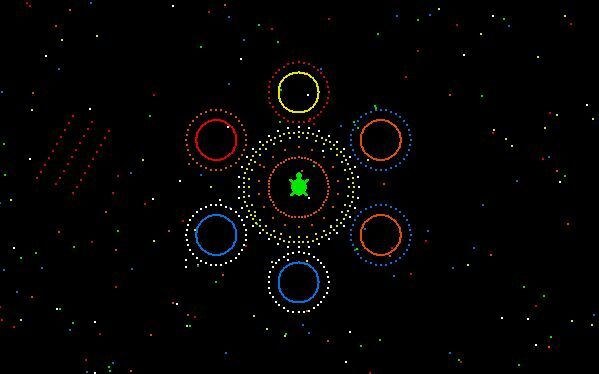 What happens when you create concentric circles with different spacing between the dots? Seek inspiration from the galleries of aboriginal art listed above. Can you recreate some of the patterns you see with MicroWorlds? Use the provided procedures and your own variations to create a dreamtime design that tells a story. Share that graphic story with your colleagues. Are there other types of art made of dots? Can you point to some examples on the web?